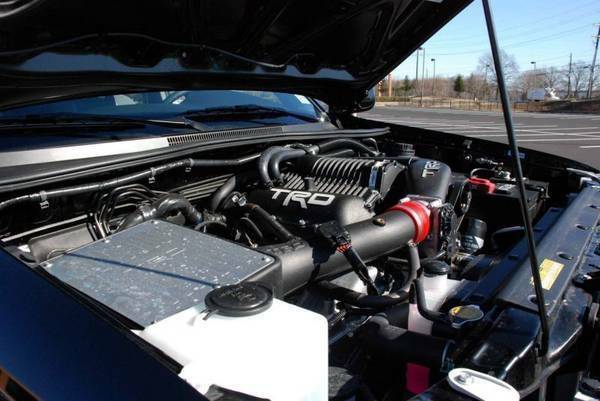 Discussion in 'Performance and Tuning' started by JMITCH08, Dec 3, 2007.
does anyone have a TRD supercharger, or is it worth the money?? i'm the advocate for the 4.7L v8 swap as opposed to forced induction, do it! smw62891, PvilleJohn, Proyota and 3 others like this. I know TW is not real big into the performance mods. There are a few people here with superchargers but I think a lot of them are probably on the customtacos and toyotanation. FYI, I think that the warranty specifically says it is voided if you add change the headers. The warranty would be the only reason I'd go for the TRD over the URD. TRD is just trying to cover their asses by saying it. They tested the remapping of the AFR's using the stock intak box, so switching to any other intake can alter the AFR and they don't want it to lean out too much or anything. I have a TRD supercharger and I love it! I would advise to get one. It could be an issue of fuel delivery. I am just theorizing and I know very little about this sort of thing. I believe that the 3.4L had problems with a lean mixture. I don't know about the 4.0L but I wouldn't be surprised that if you allow more air in or more exhaust out, you will be taxing the fuel injection system. PT910-89061. Horsepower gain from the exhaust is 8 to 10 hp. For your reference, the TRD cold air intake or any other intake system isn't compatible with the TRD supercharger. For pricing an availability, contact your local dealer. They do not mention this, but why not TRD headers? Fuel delivery was an issue with the previous generation tacos, but not really with the 4.0's. The new injectors are large enough to handle whats needed with the kit. They enlarge the 6 regular injectors instead. The flow of the injectors can handle an intake, TRD just doesn't want the AFR to lean out on anyone. Also the stock airbox holds a lot of air in the box area, so that way if you're flooring it and suddenly let off the gas, it has a lot less of a risk of stalling out on you. TRD doesn't make headers for 05+ tacomas. I was at a dealer here in Charleston today getting a new bumper bracket and talking about mods with the service manager. I mentioned the trd supercharger and he took me into the warehouse and up the stairs to proudly display a 3.4L supercharger still brand new in the box. It seems nobody wants to pony up the cash for it as its been there since at least he came on two years ago. He said I could have it for dealer cost if I wanted but he had to verify it with his boss. The list is $2800. I have 125k miles on the truck right now, is that too many to be looking at a supercharger without rebuilding anything? bluebrindle and DirtyDan120 like this.